"Licensed videogames are never good." If you talk to The Cheat in Strong Bad's game at the beginning of the game, Strong Bad laments about The Cheat wanting to play a product placement game he got for free. 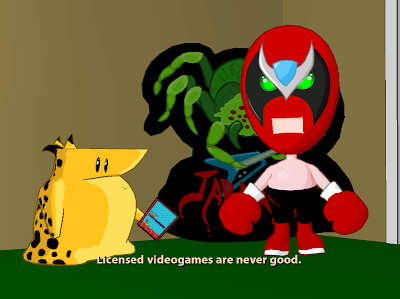 Strong Bad and The Cheat then look to the camera and say "licensed video games are never good", breaking the first of many of the fourth walls in this game.